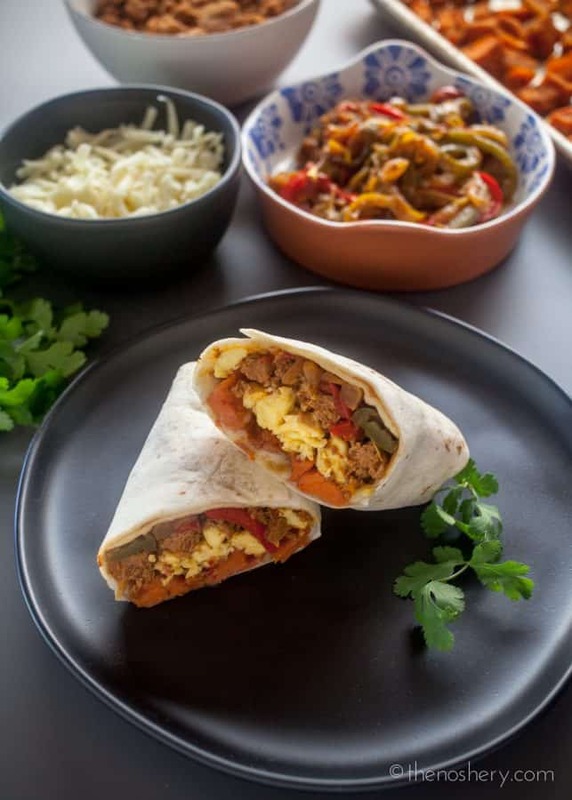 Freezer Breakfast Burritos | Mornings can get a little crazy and I don’t always have time to make breakfast. I’ve tried a variation of make-ahead egg breakfast options but my favorite is the breakfast burrito. I started making these burritos after a certain fast-food chain took my favorite breakfast burrito of the menu. 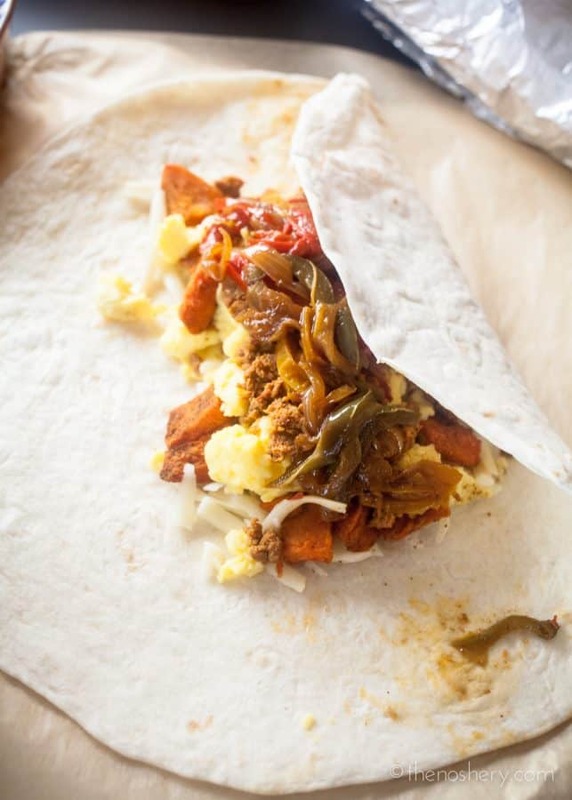 But, breakfast burritos don’t have to be just for breakfast. The great thing about freezer breakfast burritos is that they are available to grab and go for any occasion. They make a great quick lunch or dinner. 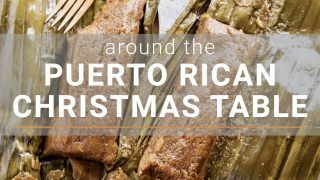 For most of my life I have lived somewhere along the east coast or in Puerto Rico. I grew up eating chorizo but the chorizo I grew up eating was hard cured Spanish chorizo. It wasn’t until I moved to Tulsa, OK that I was introduced to ground Mexican chorizo. When I first moved to Tulsa I went out to a local breakfast eatery with my husband. We were both excited and surprised to see a breakfast scramble with chorizo. But, when our plates arrived it wasn’t the cured chorizo that we were accustomed to but chorizo seasoned ground meat. Initially, we were disappointed but with time I have come to love Mexican chorizo. 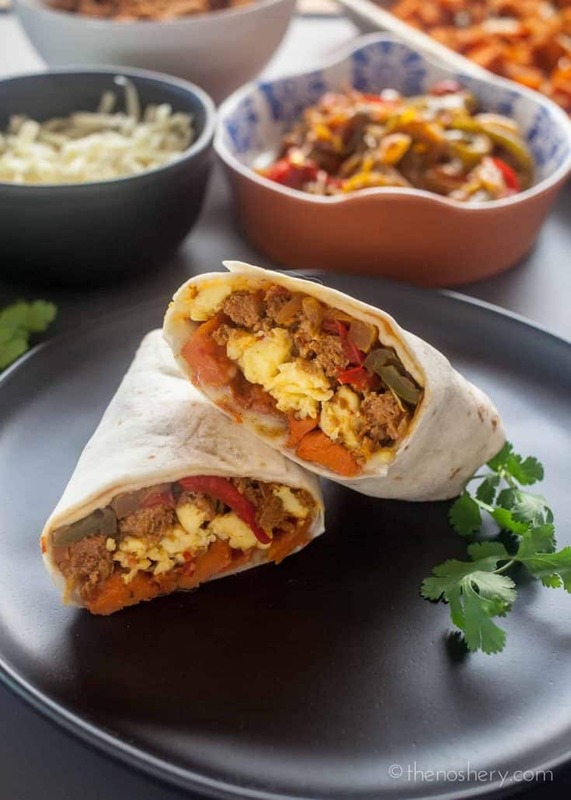 For these freezer breakfast burritos I used my homemade turkey chorizo recipe but, if you are pressed for time you can use store-bought chorizo. But let’s be honest homemade chorizo is better than store-bought. The turkey chorizo can be made in large batches and frozen to have on hand for breakfast burritos, enchiladas, or tacos. If you’re not a fan of chorizo, well you’re crazy, but you can use your favorite breakfast sausage or diced smoked sausage. If you go poking around on The Noshery you will see how my love for Mexican chorizo has grown. I like to make chorizo in bulk to have on hand for tacos, enchiladas, nachos, or any of your favorite Mexican inspired preparations. Check out some of my favorite chorizo recipes such as Queso Fundido con Chorizo a la Tequila, Spicy Chorizo Burger with Pimento Cheese, and Walking Tacos with Chorizo and Tangy Slaw. I wrap my burritos first in parchment paper and then foil. To reheat the burritos all you need to do is remove the foil and place the parchment wrapped burrito on a microwave-safe plate. Depending on the strength of your microwave you will cook the burrito for 3 – 4 minutes. Leave it on the plate in the microwave for another minute to let is settle and enjoy. Use large flour tortillas 10 – 12 inches in size. Flour and whole wheat tortillas fold and freeze better than corn tortillas. Corn tortillas will become brittle and break. To avoid soggy burritos allow the filling ingredients to cool completely before assembling the burritos. Assemble the burritos with the cheese and potatoes first to create a barrier between the eggs and the tortillas. 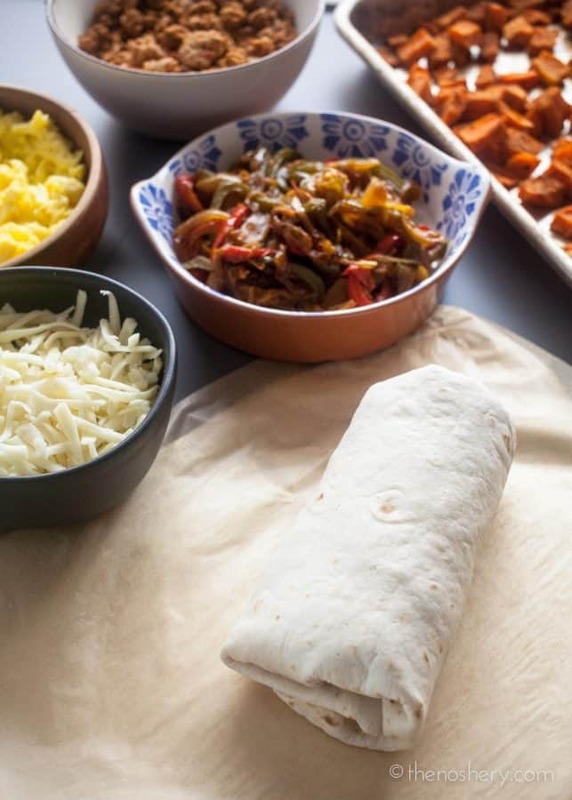 Freeze the burritos in a single layer so that they freeze quickly and evenly. To make sure you have an even distribution of filling spread the filling parallel to the edge of the counter. Fold the sides towards the center and roll the burrito away from you over the filling. These burritos are a great way to get your morning started. I absolutely love the combination of peppers, eggs, seasoned sweet potatoes, chorizo, and cheese. 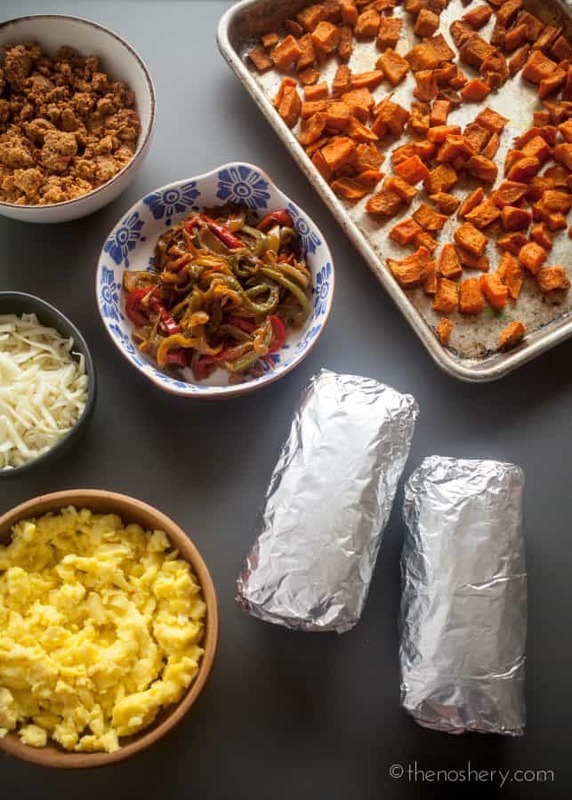 But, you can use these same freezer breakfast burrito tips for any breakfast burrito. Breakfast is without a doubt my favorite meal of the day. And, I firmly believe that it can be enjoyed any time of day. If you are looking for more breakfast inspirations check out my breakfast collection! Filling breakfast burritos with roasted sweet potatoes, eggs, cheese, and turkey chorizo. Make these over the weekend and be ready for the week ahead. Spread sweet potatoes on a large sheet pan, toss with cumin, chili powder, granulated garlic, and salt. Roast in the oven for 45 minutes, until browned and tender. Heat a heavy bottom non-stick skillet over medium-high heat add 2 tablespoons of olive oil. Add onions and peppers, stir occasionally until onions and peppers are brown and tender, about 20 minutes. Transfer to a small bowl and set aside. Cook turkey chorizo in the same skillet until cooked through. Transfer to a small bowl and set aside. Crack eggs into a large bowl, add milk and 1 teaspoon of kosher salt. Whisk eggs until well combined and frothy. Heat large non-stick skillet over medium heat, spray with cooking spray. Add eggs to the skillet and cook the eggs into fluffy large curds. Remove the eggs from the heat and set aside. Place damp paper towels between the tortillas and heat for 45 seconds in the microwave. Lay a warm tortilla on a square of parchment pepper. Sprinkle 1/4 cup of shredded cheese down the center of the tortilla, top with 1/4 cup sweet potatoes, 1/4 cup egg, 1/4 cup chorizo, and some caramelized peppers. 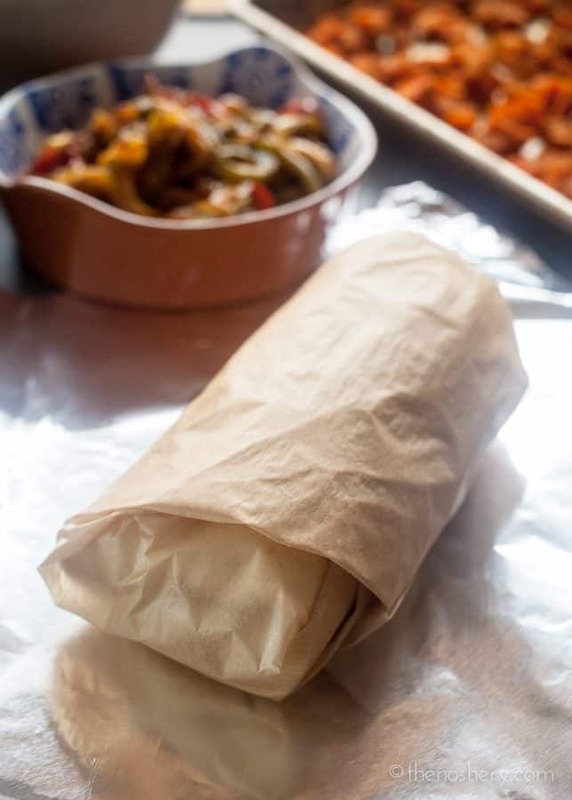 Roll the burrito tightly by folding the sides over the filling, then rolling from the bottom up. Wrap the burrito in parchment paper and then in foil. Continue with the same process with the remaining tortillas. Freeze the burritos in a single layer on a baking sheet. Store frozen burritos in a large resealable freezer bag. When ready to eat remove foil from the burrito. Microwave in parchment paper for 4 minutes, until heated through. Use large flour tortillas 10 - 12 inches in size. Flour and whole wheat tortillas fold and freeze better than corn tortillas. Corn tortillas will become brittle and break.